OK, so I must confess that not very long ago I had not seen a Blog or even knew what the blog world was about. But, a few years back, I was searching for some pictures of the style I wanted to decorate my new home in. I don't really remember what I searched. One of my Google search links took me to the most Beautiful place I had seen, and everything that I loved. It was Cielo’s “House In The Roses” If you have not been there I highly recommend a visit. Cielo, had all these beautiful images of flowers and lace and china a nice bit of whimsy all the while being serenaded by beautiful “Fairy music” I was hooked. 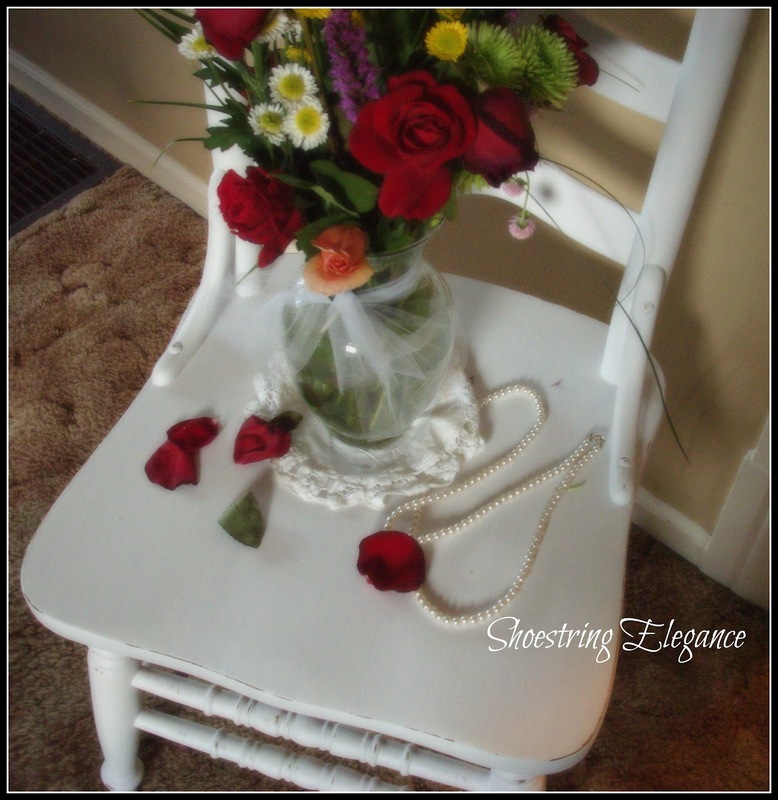 One of my favorite pictures was a beautiful white chair with a gorgeous vase of roses in it. So this post and redo is my Salute to Cielo and Thanks for all the Inspiration! One of my favorite items in dining rooms, kitchens or just in a nice corner of the room has always been Ladder-back chairs…I don’t know why. You don’t see true 4 board Ladder back chairs much anymore. But, being a Thrift store frequenter now, I came across a nice solid wood true one! It had seen some years, but the bones of it were solid, so to speak. When I saw it I instantly thought of it painted white and distressed with a Beautiful vase of Blooms sitting on it. How Blessed am I that I was able to achieve just that? Maybe not as lovely as Cielo, but I am absolutely in love with this piece and plan to enjoy for many years to come. So just a quick price break down, It wouldn't be keeping with true Shoestring Elegance style, If I didn’t tell you what a deal I was able to make this for. Are you ready? You are not going to believe this, I got the chair at the local GW, it was priced only $9.99, but wait, it was half of yellow tag day!!! So yes, I got the chair for $5! I used less than one sample size of Behr's Chalkpaint to cover it! So add a little under $3 to the tab, the rest was just a pure enjoyment in the painting, sanding, waxing and finishing of it all. This one was truly a labor of love. And the final project cost was just under$8. How is that possible? As soon as it was done I had to arrange some flowers and go cut some roses from my garden so I could enjoy it the way I had seen it in my minds eye. Hey, psst! If you get a chance go "Like" me on facebook. I have alot more pics and tidbits there. I’m just following the way I’m lead and loving every minute of it!! Especially, getting to share it with you. Many Blessing to you all! 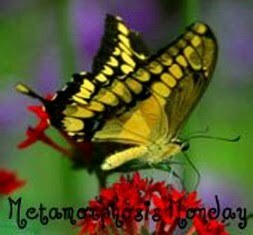 Always linking up with Metamorphosis Monday and Savvy Southern Style! I love the way your chair came out, I'm working on 4 ladderback chairs myself. I didn't know Behr had chalkpaint also, how does it compare to the ASCP? Also, did you wax the chair? Lovely redo. They really don't advertise it as chalk paint and you can't get it in their stores, but online if you look at sample colors and put chalk in for the color..It is what you get!!! Works exactly like another famouse kind of chalk paint. 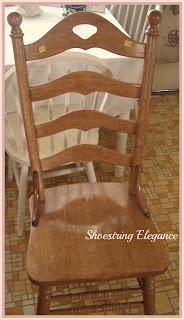 And, yes, Mary, I did a clear house wax on this!Thanks for visiting and good luck with your chairs! What a bargain...and so pretty! I like to use the sample pots of paint too. I haven't tried Behr's Chalkpaint yet. I'll have to look for it. Thanks for linking up with with us at the All Star Block Party. Thanks for having me, see my reply to the 1st comment bu Mary to find out about getting the Behr chalk paint.. Cheers! I didn't know that a true ladder-back chair had 4 boards! Your blog is not only beautiful, but informative also! Love how your chair turned out. This is lovely and wow $5?! 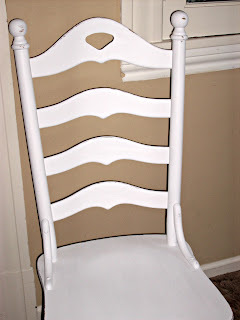 Chairs can be a little annoying to paint, but you did a great job! Thank you so much for sharing this at Rustic Restorations Weekend! It's true, Theresa, it just takes one inspirational blog to get the ball rolling. The more you find, the more you feel compelled to join along. I do happen to have four-rung ladderback chairs and I got mine for free from my brother and sister in law back when the moved down here in the 1980's. I have always loved them and I cherish them today. They were a dark brown with sort of natural, woven twisted rafia type seat for years and years and was always happy with them but a few years back I painted them white (not the seat) as well as my table and I have not regretted it a bit. Your piece is really pretty, especially with the flowers on it. You got a great deal and you made something so pretty out of it! Great job and thank you for sharing it with us at The "Sunday Stop"! Just lovely! Thanks so much for sharing at the All Star Block Party. Great bargain and a nice job, too! Thanks for the info about the Behr paint! Thank you for sharing your creativity at Potpourri Friday! Hope you will make it a week party stop! I have just become a follower and hope you will too! So much prettier in white. This chair is stunning- and so so so affordable!!! Thanks for the inspiration! Very cute! I really love it white. Thanks for sharing with the newbie party. I'm so glad you had time to stop by and see my little blog! I appreciate it! And, I am so glad you liked the chair. Thanks for the having and hosting your "Newbie"party! Thanks so much, Marty!! I so look forward to your nice words and TTT! Hope to see you again next week! IT IS WONDERFUL IN WHITE! YOU DID A BEAUTIFUL JOB MAKING IT OVER. Looks lovely! Thanks for sharing on the Creative Corner Hop. WHITE..i want a WHITE ROOM even..the pcs. I want to paint are antiques..hard to let go and DO IT [paint it] wish me luck. Good Luck, Jonell!! You are going to Love the pieces once they're done. Don't get freaked out after just one coat (I always do), The end result is so worth it!! Thanks for stopping by! It looks lovely. The house in the Roses, was one of the first I came across as well. I look forward to visiting often!! That is such a lovely chair. You did a wonderful job! Thanks, Nicole! You are too kind. Thanks so much for hosting such a lovely party and Blog Kathryn!! Oh, I will definitely be back next week just finished two more projects, that I am anxious to share!! See ya next week. 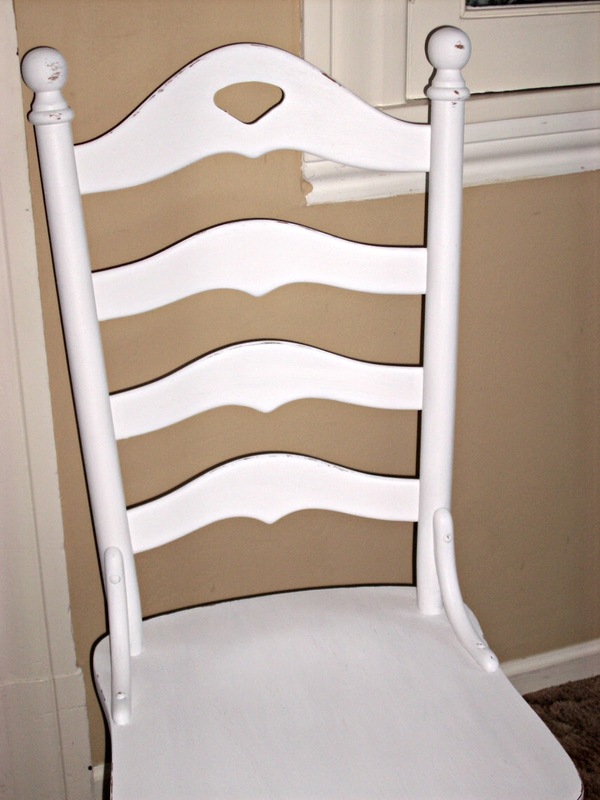 I would have to say that there may not be anything prettier than a simple white ladder back chair. A nice update on a traditional look. Thanks for sharing this week on BeColorful. I'd have to agree with you!! Thanks for hosting! Just LV dropping in to see what you were showing off today. Your post reflect who you are most every time. Well done. I love your chair. I too have a chair fetish and a leg fetish. That is furniture legs. lol Thanks for sharing your redo and what a bargain. I'm visiting from Transformation Thursdays. Thanks for your kind comment,Peggy, we chair fanatics have to stick together! ~Theresa. 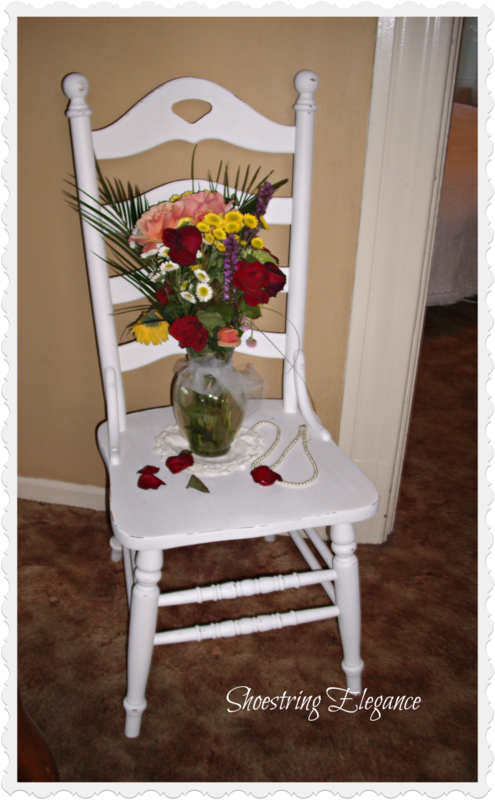 Beautiful chair makeover. I just love keeping up with your latest doings & makeovers. You have such wonderful ideas you share with all of us. I've nominated you for the Versatile Blogger Award. You can go to my blog to check out all the details. Congratulations! Thank you SO much, Stayce!! Your words and actions are very kind and super appreciated..I mean, I know I love what I do, but its always so nice to find out that others do too!!! Thank You for that!!! Thanks so much, Courtney!!! I hoping to hook up with you @ Feathered Nest Friday, a little bit later tonite!! I'll be back! I'm glad you liked it! 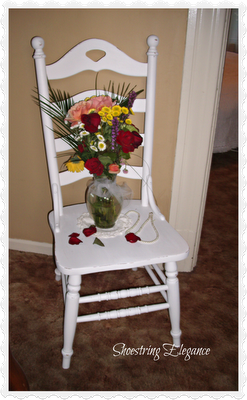 Isn't that a pretty chair you re did~ I think it is so fun when we get a good half price deal at Good-Will! I love this look, so elegant and you did a great job on the redo:) What a great addition to any home (and who would believe the price:). Thank you for sharing this beautiful chair at Freedom Fridays. Have a simply marvelous week! I love after so much better than the before. The white looks so clean and sharp. Thanks so much for sharing on Tout It Tuesday! Hope to see you tomorrow. Thanks for all your support!! Love sharing with you at Claiming Our Spaces! Hi, Kathy!! Thank you so much for your very kind words! I have been very good at getting the "Good finds" @ Goodwill!! But then again, if I didn't,then I'd have nothing to share with you all..LOL..I'm glad you know Cielo's blog, as well! I don't know her, only through comments back and forth but she inspires me regularly, as does your Delightsome Life, I do mean that!! I love your Blog!! I am so honored that you are feature this project, in particular, it has been one of the closest to my heart, so Thank You, once again! Hi Theresa: What a beautiful chair, and such a romantic styling in your photo--lovely! Thank you for sharing it with us, and the information on Behr chalkpaint--I will check it out! new follower! love your chair and your blog. Hope you'll visit me too.